Any biomass waste – from wood to peanut shells – releases carbon as it decomposes; but it can be stabilized in a kiln by pyrolysis (heated to greater than 400 degrees C in an low oxygen environment) to create biochar. The biochar is then worked into the earth in order to lock carbon into the soil. This was a practice followed by ancient South American civilizations – which exposes the idea as a “re-discovery” rather than a discovery. What is groundbreaking, however, is the concept of using biochar to mitigate our current predicament of runaway greenhouse gas emissions. According to experts, billions of tonnes of carbon could potentially be sequestered in the world’s soils, specifically from agriculture and forest waste. Biochar appears to lock carbon in for much longer than other forms of sequestration: a plant or tree will only sequester carbon for 15 to 20 years, for example, whereas it has recently become apparent that amending biochar into soil will sequester it for at least 100 years; some experts have said over 5000 years. 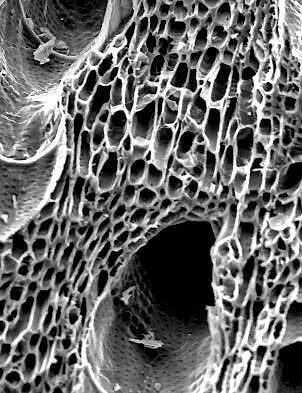 When you look at the magnified picture of biochar to the right, you see a cellular like structure that has enormous surface area. We liken it to a condominium apartment complex, just ready to be filled up with nutrients, moisture and beneficial microbes in a way that is helpful to roots. Biochar anchors soil nutrients and organic content extremely well at a time when soils around the globe have lost half of their carbon due to industrialized agriculture. How do you make Biochar? Biochar is made through a process called pyrolysis where biomass is “baked” with little oxygen under controlled temperatures and pressures. This releases a highly useful volatile gas and leaves a charred material that is 60 to 90% carbon. A small fraction of the gas (syngas) is used to perpetuate the production process and the remainder can be used to generate carbon neutral electricity, heat for adjacent buildings, hydrogen gas, and bio-crude oils and fuels. At AirTerra we see three key reasons why Biochar is vitally important. Biochar is a very low cost soil amendment that greatly improves quality of soil, increases water retention, greatly reduces fertilizer leaching and ultimately increases the plant yield of vegetation grown in biochar amended soil. Biochar is carbon negative. CO2 is first removed from the atmosphere through photosynthesis in plants; then, after biocharring these plants, it is amended into soil for thousands of years. Biochar helps the natural carbon cycle put black carbon back into the ground – where it came from in the first place. Biochar reduces climate change caused by emissions of carbon dioxide (CO2) and other greenhouse gases (GHG). 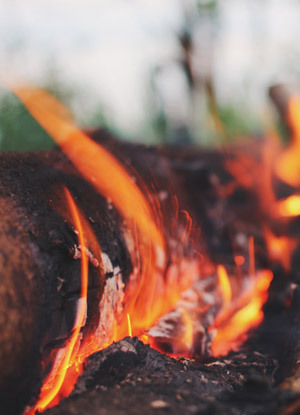 Biochar is a way for carbon to be drawn from the atmosphere and is a solution to reducing the global impact of farming and in reducing the impact from all agricultural waste. Since biochar can sequester carbon in the soil for hundreds to thousands of years, it has received considerable interest as a potential tool to slow global warming. The burning and natural decomposition of trees and agricultural matter contributes a large amount of CO2 released to the atmosphere.